Only 9 percent of Americans support war in Syria. Will they rally ‘round the flag or will this be the least popular war in decades? 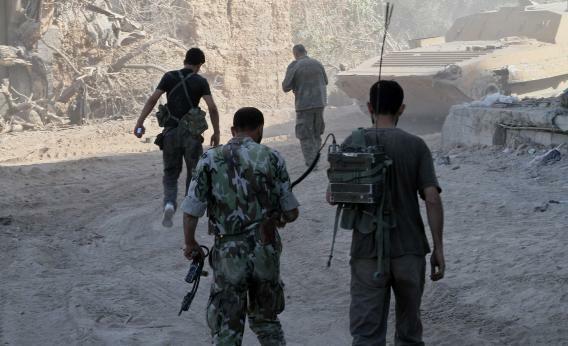 Syrian army soldiers deploy in the Jobar neighbourhood of Damascus on Aug. 24, 2013. As Secretary of State John Kerry made the Obama administration’s most forceful statement yet on Syria’s alleged use of chemical weapons, a new Reuters/Ipsos poll finds just 9 percent of Americans supporting intervention in Syria, with about 60 percent opposed. As Max Fisher notes, this means intervention is even less popular among American than Congress. Unless those numbers turn around rapidly, it also could set a new standard for the American military going into battle without public support. By contrast, 47 percent of Americans supported the U.S. intervention in Libya in 2011, which Talking Points Memo noted at the time was the “lowest level of support for an American military campaign in at least 30 years.” Seventy-six percent of American initially supported the Iraq War, and 90 percent supported U.S. action in Afghanistan in 2001. On the eve of NATO military action in Kosovo in 1999, Gallup described public support as “tepid” at 46 percent. By contrast, 81 percent of Americans thought that George H.W. Bush was “doing the right thing” prior to the beginning of Operation Restore Hope in Somalia. Fifty-three percent initially supported in the invasion of Grenada. Even at their worst points, support for the wars in Iraq and Vietnam hovered around 30 percent. I recognize there’s always a Rally ‘Round the Flag Effect and the level of support for action in Syria could change once the cruise missiles start flying and Americans feel the need to support the military action out of patriotism, but the baseline here is still pretty dismal. In an analysis of the Rally ‘Round the Flag Effect in the leadup to the Iraq War, James Lindsay of the Brookings Institution was impressed that the level of support for war had increased from “between 52 and 59 percent” to around 70 percent “as diplomacy began breaking down” in the months prior to the invasion. In the case of Syria, support for intervention could quintuple and it would still only be around the level of the Libya intervention, which was not exactly one of President Obama’s most popular initiatives. To paraphrase Donald Rumsfeld, “you go to war with the public you have.” But we may be getting into uncharted waters here.